For the people that have everything, here are my top three unique gift ideas for this holiday season. One $20 bracelet funds pulling one pound of trash. With a 750 ml reusable bottle you’ll pull one pound of trash from the ocean and coastlines. When you purchase the 4ocean cleanup combo, you will pull 2 pounds of trash. Peel Away Labs are the smarter alternative to traditional bedding; a fitted sheet with 5 peel away layers. The special blend of fibers is combined with a breathable waterproof membrane that allows a cooler sleeping experience. Sleep on each layer of Peelaways for 7 to 10 days, then just peel away the top sheet to reveal a clean layer below. Peelaways absorbs fluids and allows resting with confidence. The patented technology allows sheet changing instantly. Each layer is soft and 100% waterproof; perfect for spills or accidents. Have a fresh sheet in under 1 minute. Sleep on each sheet for up to 50 nights – clean sheets guaranteed. Sounds like the perfect gift for travellers! Place Peelaways with color stitching at the head of your mattress. 2. Peel down from top corner and along the seams after 7-10 days or when soiled. “Absolutely. Positively, Genuine. 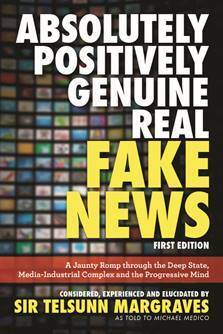 Real Fake News” is a new book that pokes fun at real/fake news. More and more Absolutely, Positively, Genuine, Real Fake News is coming across the pipeline, and Sir Telsunn Margraves has chronicled important fake news in the book that has been, heretofore, ignored by the mainstream news media. This obvious attempt to hide this significant news from the American people is expected, but no less tragic when “carefully edited truth” is being kept from all of us. George and Amal Clooney Open the Beverly Hills Muslim Outreach Center – London, England’s loss is Beverly Hills, California’s gain as the “A List” billionaire power couple relocates to Los Angeles. Sir Telsunn Margraves was in the crowd as the dynamic duo arrives at the airport to announce the opening of the “George and Amal Clooney Muslim Outreach Center in Beverly Hills.” LA Mayor Eric Garcetti, CA Governor Jerry Brown, and Weldon Blunt, Airport Public Waste Technician are all there to greet George, Amal and their children. Which of the three gift ideas do you like the best?